We're taking a look at the potential behind Dragon Paladin the upcoming Rise of Shadows expansion! Our Heartstone Dragon Paladin Deck List Guide is an early theorycraft look at how this old archetype might play out in the Rise of Shadows expansion! 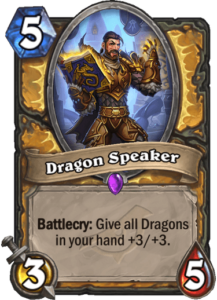 Paladin is getting some serious looking Dragons in the new set, and we're excited to see if this archetype can finally rise high in the meta. If you aren't an old school Hearthstone player, then you might not remember the first attempt at Dragon Paladin. The class got Dragon Consort in the Blackrock Mountain adventure, which was seen as a strong piece of the puzzle. We also got the very strong neutral Blackwing Corruptor to work with. While these weren't enough, One Night in Karazhan came around and added some more support in Nightbane Templar, Book Wyrm, and Netherspite Historian. Unfortunately, even with all of that Dragon support in those early expansions it was never enough to bring the deck high into the meta. Now that Rise of Shadows is on the way, it looks like Blizzard is giving the archetype another chance to shine! Will it be enough? We'll have to wait and see! If you're curious about the Rise of Shadows expansion, check out our full list of spoilers and a full guide. Not many people playing Paladin right now, but the following Dragon Paladin list has shown some promise. We'll be updating our deck guide in the near future! This deck is likely going to need some more help, but for now we've got at least a decent start! 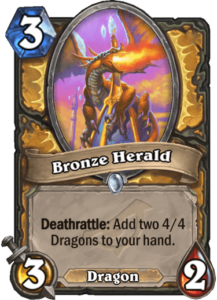 This is the key to the deck currently, because those 4/4 Dragons you might've gotten from Herald could turn into 4-Mana 7/7s that will be real problematic for your opponent. If your deck is full of Dragons, you will also have the chance to buff them up as well. This is a powerful card and could give you a ton of extra stats if you have a good hand for it. 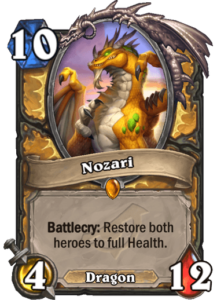 While it's obviously not great to restore your opponent's health to full, it won't really matter if you have a full board of buffed Dragons. This is a stabilizer card, that basically brings you back from a beating, and pairs extremely well with High Priest Thekal. We're going in a more control direction, and if you've survived up until this point, then this card will help seal the deal. Here's a look at current cards that will likely make an appearance in this deck! We're looking for a more control heavy build, so we want to survive in the early game and take over late. Cathedral Gargoyle - This card is the key to the early game. Getting both Taunt and Divine Shield on turn two will be your savior against aggressive decks. This will hopefully give us enough time to get our Bronze Herald down and work on building up a hand for Dragon Speaker. Faerie Dragon - We're hurting for early drops, and while this isn't the best it's a Dragon. It also becomes a 2-mana 6/5 if it gets hit by that Dragon Speaker buff! Aldor Peacekeeper - Aldor will hopefully keep our face from getting too busted up before we get a chance to play some Dragons. High Priest Thekal - Great combination with Nozari, and any other healing we decide to add to the deck. Consecration - Going to need a way to clear wide boards, hopefully this will be enough! Equality - It's way worse now, but we might just have to play it because we'll have no other way to clear boards. Truesilver Champion - Our trusty 4-drop weapon is going to have to carry our removal burden. Twilight Drake - We're probably going to need more card draw to support old Twilight Drake, but it's still a pretty good card with a medium sized hand. Dragonmaw Scorcher - Decent AOE but this would largely be reliant on running Equality which is not so great after the nerf. Crowd Roaster - Would be used for late game removal, but potentially only a 1-of because the card is pretty slow. This card does get a lot more survivability with the buff from Dragon Speaker. Lay on Hands - Some late game healing and card draw is exactly what we might need if we're fighting to stay in the game!